The Mixed Marvel Arts crew is cleaning out their closet and giving you a chance to catch up on last year’s Marvel mega-event, Secret Wars. We are giving away more than 50 comics which tie in to Jonathan Hickman’s epic conclusion to his Fantastic Four and Avengers runs. Find out the story behind Ben Grimm’s role as the Wall in Kieron Gillen and Filipe Andrade’ Siege; the origin of Dan Slott’s Amazing Spider-Man villain Regent in Amazing Spider-Man: Renew Your Vows; and revisit many X-Men alternate universe storylines, including Age of Apocalypse, House of M and Years of Future Past. Other notable events found in the tie-in comics include Miles Morales joining the mainstream heroes in Ultimate End and Spider-Gwen and her fellow Web-Warriors surviving the Battleworld in Spider-Verse. These comics can be yours for the taking! In order to express interest in the comics, please follow the Mixed Marvel Arts on their Facebook and Twitter page and ‘Like’ and ‘Share’ this August 2016 Comics Giveaway post. 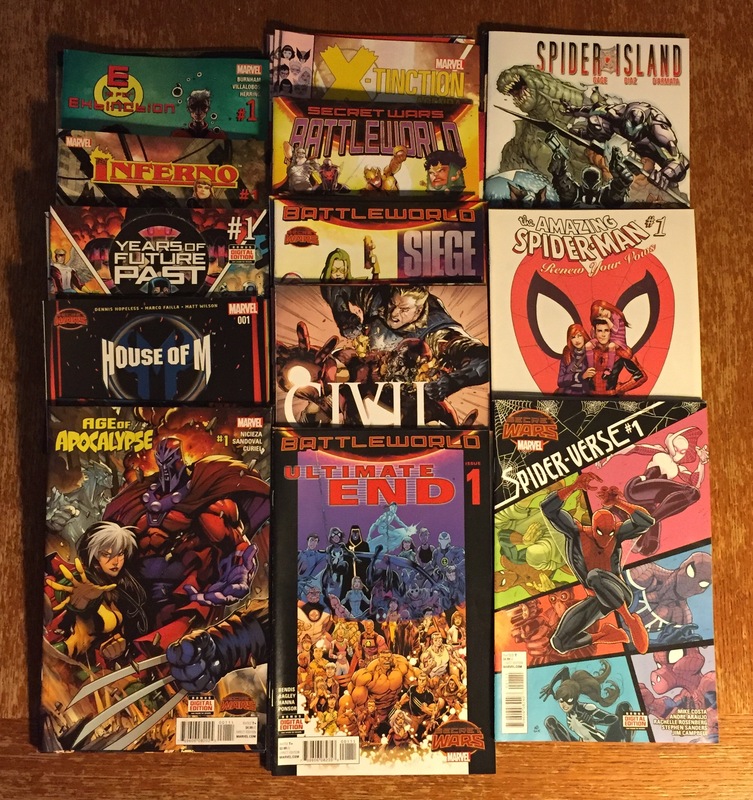 The more emphatic and supportive you are on social media, the better your chances are of winning this haul of comics! Only likes, shares, retweets and comments on the Comics Giveaway post count as entries. The Comics Giveaway is only eligible for fans in the United States of America and Canada. Mixed Marvel Arts will cover the shipping costs of the comics. Digital copies of these comics are not included, all comics should be considered to be in good condition. The current Giveaway will run from Monday, August 15, 2016 to Monday, August 29, 2016. By following, liking and sharing this post, you are allowing the Mixed Marvel Arts to announce and share your social media name/handle when awarding the comics Thursday, September 1, 2016. Our next Mixed Marvel Comics Giveaway will begin Thursday, September 15, 2016. The Mixed Marvel Arts is in no way associated or endorsed by Marvel Entertainment or The Walt Disney Company.